One of the themes of my work is to help organisations realise the potential of their people. For many businesses, it is the deciding factor between excellence and mediocrity. However, it would be foolish to believe that the fault lies solely with management: how many of us can say that we are intent on fulfilling our potential? In economic terms, 2013 will be no different to 2012. In personal terms, though, you are not bound to the same landscape. Your life is in your hands. However, before you start the stressful process of creating a set of immutable goals, why don’t you make a list of just three things that you want to change in 2013. Try not to make them too vague; but something you know that you can work at incrementally, without falling off the wagon and, if achieved, will make a lasting difference to your life. Once you have written down the three most important things, make sure to give yourself a diary reminder at the start and end of each day. 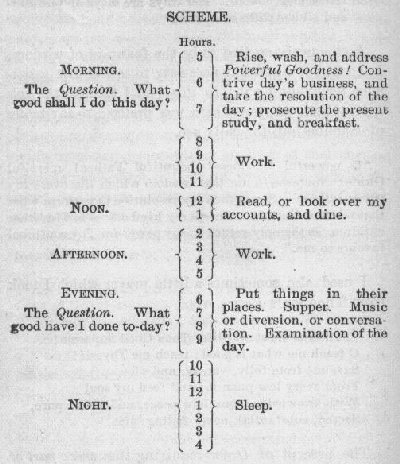 This is not dissimilar to what Benjamin Franklin did when positing his two daily questions (see below). You need to remind yourself of the original commitment, and check in at the end of each day on your progress. Remember you have the whole year to reach your objective. The trick is not to expect too much too soon, but to keep stubbornly pursuing your goal. As I have already said, one of my objectives for 2013 is to publish at least one book. In order to achieve that I have to write (duh… I know it seems obvious), and I will be reminding myself to write at least 1000 words per day with a view by 31 August to have a book ready for publication (it might be earlier). I also want to start riding more miles per week, and I think a realistic target is 100 miles spread over three or four days. Recently, I have started to keep an electronic diary (I use Penzu Pro). It has really helped me to get a helicopter view of where my time is going, and the level of focus against any one activity. You don’t have to go the electronic route but keeping a daily journal is very helpful in focusing your efforts and reminding you, when you most need it, quite how far you have come.